Treatments may be covered under Pacific Blue Cross, DVA, RCMP, Manulife, Great West Life or Sunlife. Vancouver are helping hospital patients feel a little better with a nonprofit organization that's garnering plenty of attention. 8 Longtime Crescent Beach restaurateur John Kavanagh shares his recipe for success – and other delectable dishes – at Seahorse Grill. 18 Create a backyard oasis that will be the envy of your neighbourhood. home with Indulge's top five B.C. roadtrip destinations. favourite places around the province to wine and dine. the carefree ambience, the opportunity for endless adventures outdoors. But some days, as I'm blearily making coffee while the rest of the world sleeps, I can't wait for the dead of winter to return. Until then, let's enjoy the perks of the season, and there are plenty to be found in this issue of Indulge. Sassy summer styles for all occasions, a backyard makeover that will make you never want to go inside and the most breathtakingly beautiful road-trip destinations around the province. We speak with two young Vancouver women who are helping people in their hour of need by providing free esthetic and spa services at hospitals and hospices around the Lower Mainland. Chef John Kavanagh welcomes us to his Crescent Beach restaurant, Seahorse Grill, for some savoury seaside dishes, and insight into his many decades in the business. And speaking of food, wine columnist John Schreiner gives us his favourite B.C. wineries to enjoy a bite to eat along with your vino. We hope you enjoy this summer issue of Indulge, and all the wonderful moments the season will bring – even the ones that start a little too early. Indulge is published four times annually by Black Press Suite 200 2411 160 St. Surrey, BC V3Z 0C8 Tel: 604-542-7429 Fax: 604-531-7977 www.indulgemagazine.ca Distributed free to select households in the Lower Mainland of British Columbia. 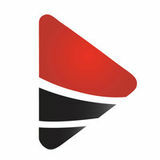 Paid subscriptions available. Reproduction in whole or in part is prohibited. The publisher is not responsible for unsolicited manuscripts or photographs. touch of lipstick, some brightly painted nails, freshly trimmed hair – all simple, feel-good things that help to brighten one's spirit, on the outside and within. Little touches such as these are easily taken for granted, but for patients battling illness in hospital, can add some much-needed colour during otherwise dark days. It's an idea that sparked a vision for Vancouverite Leigh Boyle several years ago, when a friend's mother-in-law was living the last of her days in North Shore Hospice. "She wanted to have her hair and nails done, and it was a surprisingly hard request to fulfill," Boyle explained. "She ended up passing without that happening. But we started thinking, if she wanted it, maybe others would want it too. And maybe we would be able to make that happen." In 2012, The Lipstick Project was launched, offering free professional spa services to men, women and children who are battling illnesses in hospitals, hospices and other facilities. Leigh Boyle (left) and Natasha Thom at a fundraising event last year. events throughout the community, which include taking part in Children's Hospital's annual Camp Day in Squamish, as well as volunteering for the Ronald McDonald House Amazing Journey competition, which took place June 6. Thom said that although the group has a strong foundation of volunteers, they're always looking to grow – a sentiment echoed by Boyle, who said dreams of expanding throughout the province and beyond are in the works. "One of our goals is to one day have chapters in different cities across the country," Boyle said. Boyle's bold vision for The Lipstick Project – coupled with the hard work she and her team has already put into the organization since its launch – landed her on this year's list of BCBusiness Magazine's Top 30 Under 30, honouring young entrepreneurs, CEOs and philanthropists. A patient at Ronald McDonald House paints nails. SUMMER S i d e w a l k S a l e ! July 16th - 19th D o n ’ t M i s s I t ! everyday,” he recollects while thumbing through a well-worn book of recipes. “That kind of experience sticks with you. Everything possible, from the two-day veal stock to my family’s soda bread recipe from the 1800s, we do from scratch here too. The prep is the real work. The cooking is fun.” Moving from Des Gitans to become chef at Wolfie’s in White Rock in 1996, Kavanagh purchased Wolfie’s outright a little over two years later, before selling in 2005 to relocate to Crescent Beach. That guiding edible ethos has remained unflagging, forever fuelled by the changing seasons. At the start, you are trying to prove yourself, but as the years go on you realize that every customer is as important as the dishes you create. Salted Caramel Croissant 4 croissants 125 g sugar 3 egg yolks 250 ml whipping cream Pinch salt Tear apart croissants, place in baking pan lined with parchment paper. Whisk egg yolks and half the cream. Pour over croissants evenly. In a sauté pan over medium heat, add sugar and salt, stirring to caramel colour. Add remaining cream and bring to a boil before turning down the heat and stirring until smooth consistency. Remove the salted caramel sauce from the heat and let cool for 10 minutes. Salted Caramel Croissant (continued) Pour sauce over croissants, cover with aluminium foil and place in a 350° F preheated oven for 30 minutes. Remove foil and turn oven up to 400° for 15 minutes. Remove from oven and let cool. Portion onto small plates and top with seasonal fruit and sorbet or vanilla bean ice cream. Enjoy. In a medium pot, over medium-high heat, heat the olive and add onions and garlic. Sauté for one minute before adding the celery, carrot, bay leaf and thyme. Season with salt and pepper, deglaze with the lobster stock and wine, then add the cream and bring to a gentle boil before adding the potato and corn. Bring back to boil, add your seafood and simmer for four minutes. 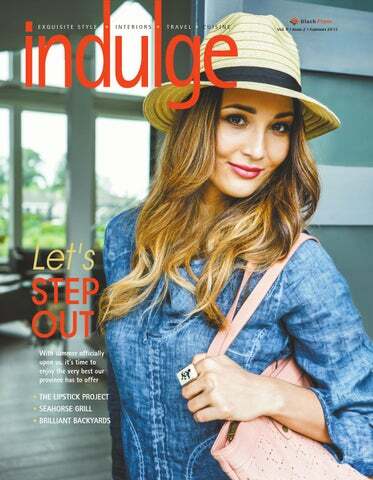 The look: On the cover, and left: Christine is ready to step out into the sun, in a denim jumper dress by Grizas, brimmed hat and ring from Edge Fashion (604-535-2579). She has all her summer supplies close at hand in her pink tote bag from Aldila Boutique (604-535-4448). Page 14: Christine is wearing a Banana Blue printed dress with John Fluevog shoes and earrings and bracelet from Edge Fashion. The dress is accented by a silver embellished waist belt from Pistachio Boutique (604-385-1067). Page 15, top left: This white Frank Lyman dress with Grace Chuang New York black jacket, and turquoise belt are from Pistachio Boutique. Shoes are by DKODE, from Edge Fashion. Page 15, bottom left: Ready for the pool, Christine is in a black one-piece retro swimsuit from Beaches Swimwear (604-531-5666), a silver circle necklace from Pistachio Boutique, earrings from Aldila Boutique, a Marianne Greaves head scarf from Edge Fashion and Thierry Lasry sunglasses from Sight for Sore Eyes (778-294-1132). Page 15, far right: This printed Marianne Greaves dress and funky Patricia Burnett necklace are from Edge Fashion, with a bracelet from Pistachio Boutique. The setting: Valued at $2.2 million, the grand-prize lottery home for the Hometown Heroes Lottery is the highest-valued home to date for the lottery. Located in beautiful Morgan Creek in South Surrey, the home backs onto a large pond, boasts three bedrooms upstairs, a great room on the main floor, a large covered deck and lounge, theatre, games room and two additional bedrooms in the basement. with inset flag stones are a non-labour-intensive way to create a patio space. "You don't have to go extravagant or expensive to do that." Another simple and cost-effective element to add to a backyard is something that creates a focal point, Bjorge said. This could be by way of a fire pit, fountain or even a large, decorative rock. "Rocks as features, they create a sense of permanency, and you don't have to maintain them," he pointed out. If your yard needs a major makeover, however, Bjorge has some lavish large-scale ideas to create a peaceful piece of paradise for you and your family. Additions ranging from multi-level, terraced patios to outdoor kitchens and resort-style swimming pools complete with infinity edges. "We've done some very high-end spas that are all done in rock work to emulate a natural hot springs, with waterfalls coming into it," Bjorge said. SUMMER COLLECTION now in store! ou don't have to look very far these days to find enticing travel deals, offering to jet set you away to a tropical paradise, on a European excursion or a wild weekend away in Las Vegas. While such getaways have much to offer in the way of excitement, the arrival of summer on the west coast presents the perfect opportunity to hit the road and explore what our province has to offer. While road trips take a little extra time – and a lot of planning – they also offer the chance to take in every little magnificent detail, and show you why our province is called Beautiful British Columbia. There's no shortage of places to visit in B.C., however, Indulge has selected its Top Five Must-See destinations for the ultimate summer road trip. on the other end is well worth the journey. Endless beaches, surreal landscapes and ancient rainforests make Tofino a destination for nature lovers, surfing enthusiasts, hikers and foodies alike. Some visitors may choose to while away the hours with their toes in the sand, enjoying the saltwater breeze on their faces. But if you're more inclined to partake in all the area has to offer, there is plenty to keep you busy. Surfing, whale watching, kayaking, fishing, hiking, zip-lining and 'flight' seeing are just a few of the activities close at hand in Tofino. And with the appetite you're sure to work up after embarking on some of the aforementioned adventures, the village has a variety of fine-dining establishments, casual eateries, pubs and cafes to choose from. Boasting the world's longest free-span gondola – the Peak 2 Peak, at a length of 4.4 km, connecting Whistler and Blackcomb mountains – a ride aboard this landmark offers stunning 360-degree views of the village, mountain peaks, lakes and forests. Whistler is also one of North America's top mountain-biking destinations, with a dedicated bike park that offers vast terrain for bikers of all abilities, consisting of more than 200 km of liftserviced trails. For even more adventure, check out the local zip-lining and bungee-jumping companies that operate out of the area. When it's time to relax after a day of sightseeing and adrenaline, Whistler Village has an array of restaurants, pubs, clubs, shops, spas and cafes to unwind in. Haida Gwaii This destination is by far the most remote in the province – a series of islands located on the western-most point of northern B.C. – but ranks atop the must-see list for adventurous travellers. Ancient temperate rainforests with unimaginably huge old-growth trees, quaint villages steeped in culture and history and secluded inlets and beaches make up this remote part of the province, formerly known as the Queen Charlotte Islands. The villages of Massett and Skidegate are home to several world-renowned Haida artists, many of whom work out of their homes that are open to the public. A visit to the Gwaii Haanas National Park and Haida Heritage Site offers a plethora of outdoor activities, including kayaking, bird watching, fishing and sailing. Getting there is the tricky part – by road, you drive to Prince Rupert (close to 17 hours) and then take a seven-hour ferry to Skidegate. Alternatively, you can take a 'circle route' aboard BC Ferries' inside passage route, from Prince Rupert south to Port Hardy. For a timesaving trip to Haida Gwaii, Air Canada offers flights out of Vancouver daily. ine is made for food and there is no place better to experience this than in B.C. 's winery restaurants. Many wineries now have picnic areas, with visitors welcome to bring their own sandwiches or buy a cheese plate and a glass of wine. But you can dine in style at an astounding number of wineries. This list extends from Osoyoos to Lake Country. The Patio at Nk’Mip Cellars in Osoyoos: The lunch menu includes a caramelized cauliflower and goat cheese soufflé, a burger, roast chicken and wild mushroom gnocchi. Dinner choices extend from salmon to bison tenderloin. The Sonora Room at Burrowing Owl Winery: The lunch menu runs from a pulled brisket sandwich to JOHN mussels and game hen. The dinner menu adds duck confit, lamb sirloin and sable fish. Miradoro at Tinhorn Creek: The lunch menu includes grilled cheese sandwiches, several pizzas and other pastas, a charcuterie plate and even a steak. The dinner menu adds salmon, chicken, pork chops and grilled octopus. GET YOUR OUTDOOR BARBEQUE AND POOL BOILER READY SUMMER’S HERE! in the photos • Left, country superstar Shania Twain paid a visit to Hjorth Road Elementary June 8 to launch the first western branch of Shania Kids Can. S U M M E R has arrived at EDGE... Fashion on the Edge! Exclusive Canadian Designer lines now in-store! and Community Health Foundation's Partners in Caring Gala May 30. • Canada Day celebrations are in the works for Surrey, Langley and White Rock, with family-friendly festivities set to take place July 1.
summer music series taking place Saturday evenings starting July 4, featuring local and up-and-coming artists. Settle the score with stubborn sagging arms and lumps and bumps like mufﬁn tops. Show off the body you’ve always dreamed of. We are proud to announce that we now offer CoolSculpting®, the revolutionary new body contouring treatment that freezes fat. Patients are seeing undeniable and lasting results in as little as one treatment. There are no needles, no special diet, no supplements and no surgery. It’s FDA-cleared, safe and proven effective. Health Canada Approved.